A few months back while I was learning how to master the perfect doughnut bun, I came across this tip that is too good not to share. 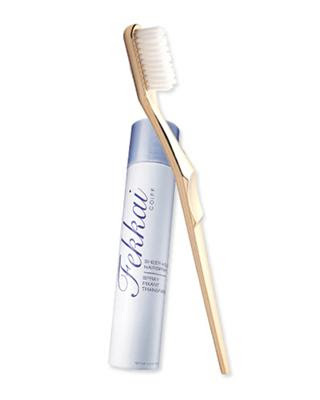 After putting your hair up in a ponytail, bun, or perhaps a chignon...spray a toothbrush with hairspray (my favorite) and then run the toothbrush over your flyaways. I have naturally frizzy hair with a ton of flyaways so I was excited about this new trick! Also, a new product (to me) that has been very helpful in taming frizzies (other than my favorite oil spray) is this spray. Right before I go to blow dry, straighten, or curl my hair I use it and it doesn't make my hair oily in 8 hours like some of the other non-frizz products do. I even have a small bottle for traveling. Love the stuff. A great tip! Haha, I'm still trying to master the sock bun... it sounds so easy, but my hair's not cooperating! I'll have to try that spray! My hair always has little frizzes that pop up!